The Center for World Music is a unique nonprofit organization whose mission is to foster awareness and understanding of the world's diverse performing arts and cultures through public performances and teaching. Its primary purpose is to draw public attention to the diversity of the world's performing arts traditions: Asian, African, European, Latin American, and American. Thus, the Center's philosophy is to promote cross-cultural understanding through appreciation of the performing arts, and to their significance to the diverse traditions of the world. More specifically, the four main goals of the Center for World Music are (1) to encourage public appreciation in of the varied cultural expressions of the world through the performing arts, (2) to provide opportunities that promote understanding of the world's diverse cultures through their performing arts traditions of music and dance, (3) to promote the diverse multicultural assets of the San Diego region, and (4) to encourage appreciation and understanding of the world's culturally diverse performing arts traditions through direct experiences in different countries and cultures around the globe. The mission, purpose, philosophy, and goals of the Center for World Music are implemented by means of four San Diego and international high-quality programs: a Concert Series Program of more than 20 concerts a year, a World Music in the Schools Program (with 14 native and native-trained artist-teachers in residence), a Special Events Program (e.g., festivals, home concerts, workshops, etc. ), and a Cultural Tours Abroad Program (with music and dance workshops and performing arts tours in Bali, India, China, Istanbul, Peru, Mexico, and Ghana). The Center for World Music was created by Samuel H. Scripps and his wife Luise in 1963 as the American Society for Eastern Arts, with an initial mission of introducing the Asian performing arts to the American public. The Society soon broadened its scope and appointed Dr. Robert E. Brown as Executive Director in 1973, when it was reborn in Berkeley, California as the Center for World Music. Activities at that time included 40 artists in residence from Asia and Africa, year-round teaching at a Berkeley facility, and a successful Indonesian Music in the Schools program (funded in part by the National Endowment for the Arts) in Berkeley, San Jose, and Oakland. At its height, the Center administered its activities with an annual budget in excess of $500,000. In 1979 the Center moved permanently to San Diego, where it continued to foster world music appreciation and performance through association with local universities and colleges, and expanded its outreach through projects developed with the local Hmong, Filipino, Indian, and Chicano communities. 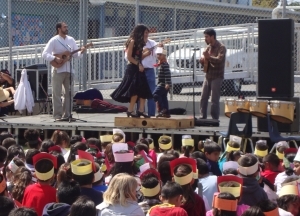 Based on its successful school programs, the Center for World Music has continued to sponsor artists in support of world music for children through artist sponsorships, including an extensive World Music in the Schools Program begun in San Diego since 1999. At the Museum School, for example, students studied Indonesian gamelan music, ethnic dance, instrument building, and Japanese shakuhachi flute via a rigorous curriculum, delivered by four artists in residence. During the 2009-2010 school year, the Center served 2,210 students at 9 schools with long-term weekly classes (13-28 weeks) and provided an additional 3,240 students at these 9 schools with school-wide assembly performances by the Center's artist-teachers, reaching a total of 5,450 students. 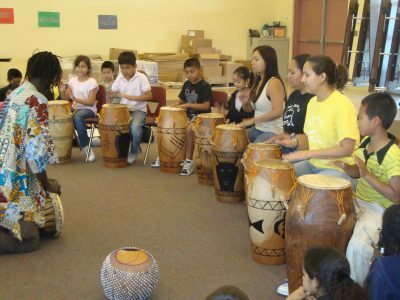 During 2010 the Center also continued to coordinate with the Visual and Performing Arts Department of the San Diego Unified School District to facilitate the implementation of the Center's World Music in the Schools opportunities. In addition, four community programs served 105 community members with long-term weekly classes (26-45 weeks), while an additional 2,600 community members attended public performances by these groups. During the Fall semester of 2010, the Center for World Music and the School of Music and Dance at San Diego State University established a new partnership that promises to ensure the vigor of the World Music Program at SDSU, a distinguished program that was established with the assistance of the Center for World Music in 1980. The Center's cadre of 14 artist-teachers are currently teaching weekly music and dance classes to thousands of San Diego's public school children: traditional performing arts of India, Java, Bali, Iran, Mexico, Ghana, Zimbabwe, and Europe. In addition to its youth programs in San Diego, the Center for World Music reaches broad bands of the population in the United States through the organization and presentation of large-scale public concerts in Southern California as well as nationwide tours for the artists it sponsors. For world music teachers, the Center has created an annual San Diego World Music Concert Series of a minimum of 20 concerts a year as a student-friendly opportunity, since student admission is either entirely free or substantially reduced from the general admission price. In 2010 alone, the Center produced over 30 public concerts of traditional music and dance from Iran, India, Ghana, Zimbabwe, Europe, Cuba, Brazil, Bolivia, Mexico, the Philippines, Senegal, China, Bali, and Java. Some of the San Diego venues for the Center's Concert Series are Seaport Village, The Neurosciences Institute, local universities and community colleges, San Diego public schools, and private homes. Aside from its unique mission, purpose, philosophy, and goals, perhaps the finest asset of the Center for World Music is its beautiful two-acre performing arts campus in the hills of central Bali that was constructed between 1987-2005 by the distinguished American ethnomusicologist and professor, and former long-time President of the Center for World Music, Dr. Robert E. Brown. With its 20 spacious Balinese-style buildings, the campus can accommodate 30 student guests and has for many years been the home of the Center for World Music's Bali two-week summer workshops (with professors and students from prestigious American universities such as Southern Methodist University, Stanford University, San Diego State University, the University of Illinois, CalArts, and the University of Washington, as well as from universities in Singapore and in England). From 1987 to 2010, hundreds of university professors and their students have attended performing arts workshops at the Center's campus in the hills. In fact, three such two-week workshops were conducted in the summer of 2010 at the campus in Payangan, Bali: SMU Drumming in Bali (June 1-June 16), Indonesian Encounters 2010 (June 16-July 4), and MIXES (July 29-August 20). The focus of the SMU workshop (Southern Methodist University, America) was on drumming from West Java (Sunda), Bali, Sumatra, India, and the Middle East. The focus of the Indonesian Encounters workshop was the performing arts of Sunda, Java, and Bali, including music, dance, and puppetry; the workshop concluded with a three-day Payangan Festival of music from Java and Bali. The MIXES workshop presented a "Collaborative Project" between faculty and students of the Yong Siew Toh Conservatory of Music at the National University of Singapore, the Guildhall School of Music and Drama in London, and the Center's cadre of native Sundanese and Balinese master artist-teachers. The focus of MIXES was on the traditional music from West Java (Sunda) and Bali, in particular a variety of interesting ensembles such as gamelan jegog and gamelan selunding. Five similar workshops are scheduled for the summer of 2011, and it is the hope of the organization's Board of Directors that its beautiful mountain retreat in Bali will continue to inspire rich and enduring cross-cultural experiences for workshop participants as the Center for World Music continues to foster awareness and understanding of the world's diverse performing arts and cultures through public performances and teaching. The Center for World Music receives support from the National Endowment for the Arts, the California Arts Council, the County of San Diego, and the City of San Diego Commission for Arts and Culture. Recent Center projects have also been supported by the Asian Cultural Council, and The Parker Foundation.